Now that Nobel Prizes has been awarded for the COBE satellite discoveries, people have become more interested in the early days, when the projects that eventually became COBE were initially created. Since I was the PI (Principal Investigator) on the first Berkeley anisotropy measurements, I have many of the original documents that are of historical interest, particularly up to our publication in 1977. Of course, I was not involved in the early work done on the spectrum measurements (e.g. by John Mather, Paul Richards, Dave Wilkinson, Ray Weiss, and others) so this is purely a Berkeley Early Anisotropy collection. Likewise I did not participate in the subsequent (post 1978) anisotropy work that played a role for COBE. Here are the documents I found, with my memories of that era. If you just want to see the documents and not their history, here is the list. They are all scanned pdfs, and the sizes are listed in MB (megabytes). But if you want to learn the narrative that connects these documents, read on. In 1972, I was a member of a small group of physicists assembled by Luis Alvarez (including Andy Buffington, Larry Smith and George Smoot) who were looking at new ways to study cosmic rays using a superconducting magnet. The original balloon borne project invented by Alvarez was designed to do particle physics with cosmic rays. It was called HAPPE -- for High Altitude Particle Physics Experiment. It had crashed, along with my thesis experiment, and Luie was encouraging us to explore new ideas. We wrote one paper together on a proposed satellite experiment for cosmic rays; that was my first co-authorship with George Smoot. But I was spending most of my time working with Steve Derenzo and Haim Zaklad on a new particle detector (using liquid argon and xenon) and had been the lead author on a Phys Rev Letter (PRL 27, 532, 1971) about it. We wanted to apply this to biomedical imaging, and I would eventually be a coauthor on the patent (#3,898,465). I had done some work on gravity waves (with Jerry Nelson and Terry Mast), published one paper, Nature 240, p 140, 1972, and given a UC Physics Department Colloquium, but I thought the field of gravitational radiation had no short-term future (I was impatient). I published an article on the Twin Paradox, and made the first measurement of a cascade hyperon collision (sole author on Phys. Lett. 38B, p 123,1972). I was interested in a lot of things. Astrophysics was hot, and I wanted to create a new experimental project in that field. I read several books, including Steve Weinberg's new book on General Relativity, and Jim Peeble's book, "Physical Cosmology." I finally concluded that my project would be to detect the expected cosmic microwave anisotropy. I spoke to my friend Dave Cudaback, and he put me in touch with Adrian Webster, who was doing a new anisotropy measurement. To my surprise, Adrian was at Berkeley for the year. He had been developing an experiment to run on White Mountain, in eastern California. He said he had the project well-in-hand, and didn't need help, but he and Dave suggested that I take the lead on a search for the Sunyaev-Zeldovich effect using the 64-meter Goldstone microwave dish antenna. As far as I know, we were the first group to try to detect this effect, which is now seen routinely. I wrote a proposal for this project, with me as the lead investigator, and Adrian and Dave as co-experimenters. I recently found a copy of a draft of this proposal, which includes some penned-in comments from Luis Alvarez: Proposed Sunyaev-Zeldovich search in the Coma Cluster. 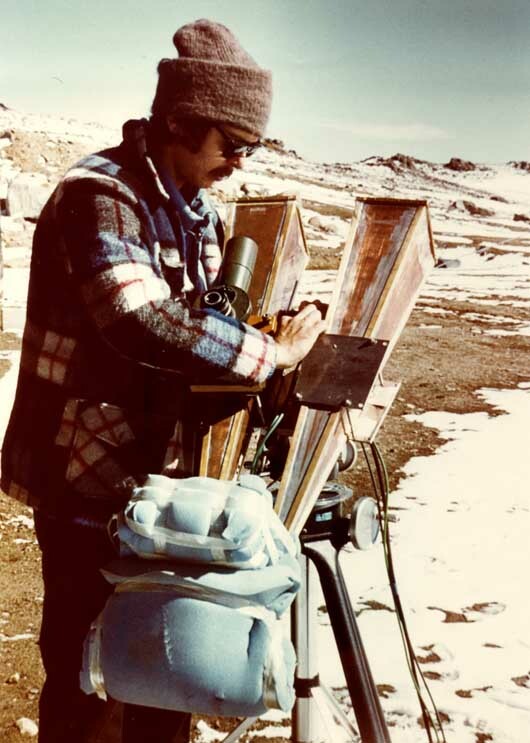 I went to Goldstone to take the data, and convinced my colleague George Smoot to come along. Even though he was not part of this project, I was hoping to arouse his interest in another cosmic microwave experiment I had in mind. We were not able to get publishable results from the Goldstone measurements. Variations in water vapor drifting over the antenna overwhelmed the real signal. Prior to the Goldstone trip, I had already become convinced that Webster's experiment would not attain the sensitivity needed to see anything interesting. His receiver noise was too high, and he had not studied all the systematics that could bedevil such a measurement. I called various people around the country, and verified that nobody else was attempting a new anisotropy measurement. Claims of detected anisotropy had been previoulsy published by E. K. Conklin at Stanford, and by Paul Henry at Princeton, but their graphs showed such large non-statistical fluctuations, that nobody in the field took them seriously. They were hampered by their relatively low frequency -- 8 GHz, which was very sensitive to galactic emissions. Even the Princeton group, led by Bob Dicke, Jim Peebles, and Dave Wilkinson, had decided to concentrate on the spectrum instead. I did visit them and see their apparatus; I also received an offer of an assistant professorship, which I turned down, against the advice of my mentor Luis Alvarez. I talked to Luis Alvarez about the anisotropy measurements, and he did his best to discourage me. Luie was never a believer in the adage, "look where nobody has looked before, and you will find." He felt that looking up blind alleys was a waste of time unless there was a good reason to think there might be something there. He said the theoretical predictions that I cited (largely from Ray Sachs at Berkeley) were untrustworthy. Theorists, in his experience, "always" predicted a result that was just out of range of the current experiments, encouraged experimentalists to improve their apparatus, and then made changes in their theory as soon as the experiment showed their old theory was wrong. In fact, he was absolutely right about this. Sach's initial predictions were for a primordial anisotropy of 1.5%, and at the time I was studying this, nothing had been seen at a sensitivity 20 times better than this. Luie said I should ignore the fact that Sach's predicts a positive result if I could only improve the measurement by a little more. I finally found a way to convince Luie the project was worth doing. I came back to him and told him that, at least, we could detect the motion of the Earth, the "Aether Drift" as Peeble's called it. That got Luie's attention. There would be a definite number to measure, not just a search for a limit. He told me to write up a proposal and he would show it to Bob Birge, then the director of the physics division at LBL. Later, Luie told me that he hadn't fully understood the calculations, and he guessed that the Aether Drift would prove to be unobservable -- that it would yield a null result, just like the Michelson-Morley experiment, but that such a null result would be very exciting -- since it would once again prove a theorist to be wrong. There was nothing Luie enjoyed more. I reviewed everything I could find, and put together a preliminary memo, dated 16 May 1973, to show to Luie. It was written in the pre-word-processing days, so I post a scanned copy: A Proposed Measurement of the Anisotropy of the Cosmic Black-Body Radiation. Luie gave me his comments, and I worked more on the memo. I felt that I had to work in Luie's tradition: anticipate every possible systematic error, and calculate everything that could be calculated, before cutting any metal. In this draft the main plan would be to try to accomplish the measurements at White Mountain using a more sensitive receiver. I also mention the advantages of eventually moving to a balloon, or operating in Antarctica. I am quite proud of the final version of the memo, "Cosmic Black-Body Radiation: Aether Drift and the Shape of the Universe", dated June 20, 1973. The memo has number "236" because it was part of a large series of memos being written by other Alvarez group members on the unrelated attempt to fly superconducting magnets in balloons. It includes copies of the papers by Coklin and by Henry; look at their plots, and you'll see for yourself why their claims of detected anisotropy were not taken seriously. Luie took me to see Bob Birge and to explain the project to him. In that meeting, Bob said he would find the money I needed to proceed. Ah, those were amazing days. Instead of writing a lengthy proposal to Washington DC, all I had to do was to convince people like Luie and Bob, and I could go ahead. I believe that without their support, and Bob's ability to find local funding (the Physics Division of LBL was still using "block funding" in which Washington sent us a block of money, and Birge and his advisors determined how to distribute it) the whole project would have been stillborn. I wrote about this in my article "Innovation and Scientific Funding" (Science, vol 209, 880-883, 1980) written after I had been given several major national awards for the anisotropy project. When I began, I had had no experience with microwave apparatus, except what I had learned as a teaching assistant for the introductory Physics 4 labs. I had no credentials to begin this project. Any decent referee would have rejected my proposal, or at least insisted that I team up with a real expert. But there were no real experts who wanted to pursue the anisotropy. So I would have been stuck. I now had approval, and money, and I needed people to help. I targeted two people: Terry Mast and George Smoot. I had worked with Terry on the gravity wave paper, but he was involved in interesting astrophysics of his own with Jerry Nelson, as well as several particle physics experiments. Nonetheless, he agreed to help. I had also given a copy of the memo to George, and I approached him cautiously. George was still working in elementary particle physics, as well as on the new balloon superconductor experiments, and I feared he would be too busy. But I asked him if he would like to be part of the project, and without a pause he said, to my surprise, he simply said, "Yes." That was a moment that would eventually lead him to a Nobel Prize! I had a lot of momentum going, and on July 12, 1973, I published another memo, "Black-Body Anisotropy: Systematic Biases from Oxygen and Water Vapor." In this memo, I concluded that we had to monitor the water vapor emission by using a second frequency sensitive to it. I also state that my calculations might be driving us to the use of a balloon gondola. In this memo I acknowledge George's participation for the first time. I have a photo taken about this time from a trip to White Mountain. It shows me with a pair of microwave horns making a differential measurement. Click on the photo for a larger version. We became very discouraged about working at White Mountain. The water vapor variations were horrendous. Yet, I really disliked the idea of flying the apparatus in a balloon gondola. My original PhD thesis was supposed to be a measurement to be made from a balloon, and the apparatus crashed from an altitude of 15 miles into the Pacific Ocean. George suggested that insted of a balloon, we could try to fly from an airplane instead -- the C-141 run by NASA for infrared measurements. George went to NASA Ames to investigate. It looked difficult, since the hatch in the C-141 was not in a good location for our use. But it looked possible, so I re-wrote the proposal in a memo format that might appeal to NASA. For the first time, Terry and George were added as co-authors. We drew diagrams showing how the apparatus might fit into the C-141. I am very proud of this memo. I think it illustrates the kind of work that one must do prior to making a measurement. Here it is: Aether Drift and the Isotropy of the Universe: A Proposed Measurement Utilizing the Primordial Black-Body Radiation", 10 Sept 1973. I thought that I could not be "Principal Investigator" on this project, since I was merely a post-doc, living on soft money. So I asked Luie if he would stand in for me in that position. He said he would rather not do that. He was an established scientist with a reputation for thinking out of the box, and he said that would interfere with me getting the proper credit for a project I had developed independently -- in fact, over his initial opposition. So he proposed instead to get me "exceptional PI status". He talked with Kinsey Anderson, then the director of the Space Sciences Laboratory. Kinsey asked the University to allow him to create such a position, and they did. They granted him three such positions, and I got one of them. I prepared a proposal to submit to NASA. It was based almost entirely on the prior memos -- with one exception. We had substituted a U-2 for the C-141. The story behind the U-2 is interesting. George had visited Ames, and talked to the scientists working down there to get the C-141 plans. We would try to fit our apparatus into that airplane, but it looked very hard to do. Maybe, we thought, we could modify the C-141 by putting in a new hatch, on the top. Luie suggested that he accompany us to a visit at NASA Ames, to meet with his old friend and former colleague, then the director of the Ames Lab, Hans Mark. Three of us went: me, George, and Luie. (I'm not completely sure; Terry might have been there too.) We met in Hans Mark's office, along with several of the Ames's scientists. Part way through, Mark said (something to these words, not an exact quote), "It seems to me that the plane you really should be using is the U-2." That came as a shock to us, and to the Ames scientists, who immediately objected. That plane only had a lower port, looking down for Earth observations, a heritage of its days as a spy plane. It had not been made available for astronomy. But Mark insisted that we look at it. He told us that we would have to cut a hole in the top, and put in supports to make up for the loss of structural strength, but he was convinced we could do it. Everyone was stunned. To get approval to use the U-2, we had to apply officially to NASA. If they approved our project, we could then officially get access to the U-2. So I took the last memo, and put it in the format required of an official proposal to NASA. I was the PI, and my co-investigators now included Luis Alvarez (to keep Mark happy), Andy Buffington (who hadn't yet contributed, but who I hoped would), Terry Mast, Charles Orth (also a newcomer), and George Smoot. The proposal shows the instrument as it would fit into a new upper hatch on the U-2. 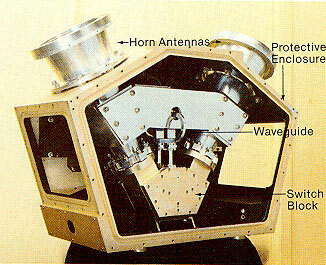 If you are familiar with the COBE instrument, you'll see that it looks very similar (see photos at the bottom of this page). The U-2 instrument we built is now on display at the Smithsonian in Washington DC. Here's a scanned pdf: of the proposal: Aether Drift and the Isotropy of the Universe. The proposal received some tough reviewing at NASA. Fortunately for us, the committee decided that it was worth taking the risk. I asked Robbie Smits, my favorite LBL engineer, to figure out how to get the apparatus into the U-2. He came up with an ingenious bicycle-chain mechanism and control system to rotate the apparatus in the way we needed, with suitable fail-safe storage position built in. George enlisted John Gibson to design the electronics. George came up with a compact layout for the horns and the radiometer. Marc Gorenstein continued to work as the senior graduate student; Steve Pollaine later joined.. Terry, Charles, and Andy dropped out to do other things. For a short time Tony Tyson came to Berkeley and did some good work reducing ground loops and improving the electronics. He became a co-author on the instrumentation paper we wrote. George approached graduate student Marc Gorenstein, and gave him a copy of the proposal. Marc had wanted to be a theorist, but the proposal changed his mind. So he took a risk and went to work for physicists who were not yet faculty members. I became his offical advisor, although he spent most of his time with George. Marc earned his PhD on the project, and was deeply involved in all of its aspects. He was the lead author on a paper we presented at the American Physical Society, shortly after we discovered what we called the "cosine anisotropy" or "dipole" and also lead author on the paper we published in Reviews of Scientific Instruments (vol 49, p 440, 1978). George and Marc were obviously capable of taking over the project, so soon after we built the instrument, I basically turned the measurement phase over to them. I had started up several new projects, including one that led me to the invention of AMS ("Accelerator Mass Spectrometry"), published in Science vol 196, p. 489 (1977). I am particularly proud of this paper since it wound up transforming the whole field of radioisotope dating; I mention it here to show how distracted I was. I was also very active with a new responsibility: Luie had nominated me to join Jason, a team of academic scientists that works on US national security problems every summer. There I met Freeman Dyson, and developed yet another experimental program I called the "Rubber Mirror." This was a program to compensate atmospheric fluctuations for ground-based astronomy using adaptive optics.. Although my particluar approach (image sharpening) is no longer used, I believe that we at Berkeley were the first people anywhere successfully to compensate the distortion to produce an improved stellar image (of Vega). Both Frank Crawford and Andy Buffington worked with me on the Rubber Mirror project. Here are two photos from that era. 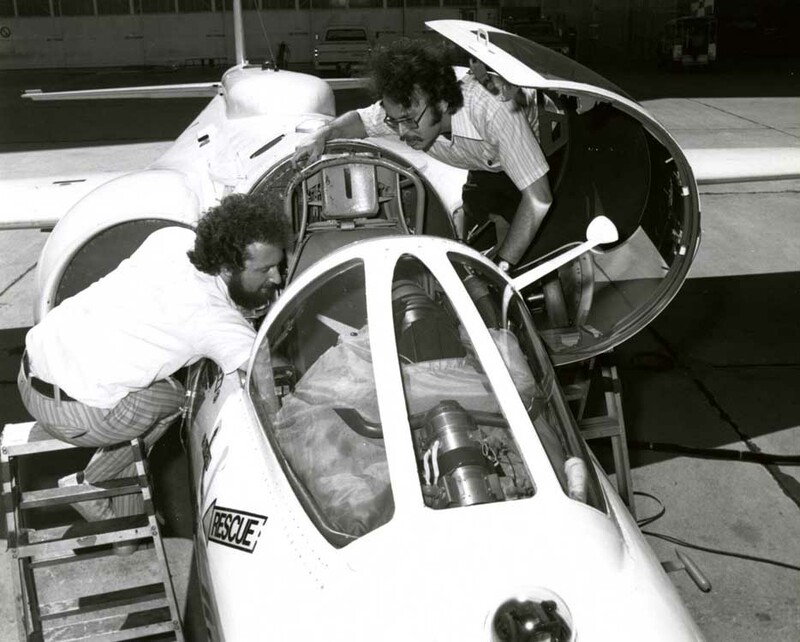 The one on the left shows Marc Gorenstein and me down at NASA Ames working on the U-2. 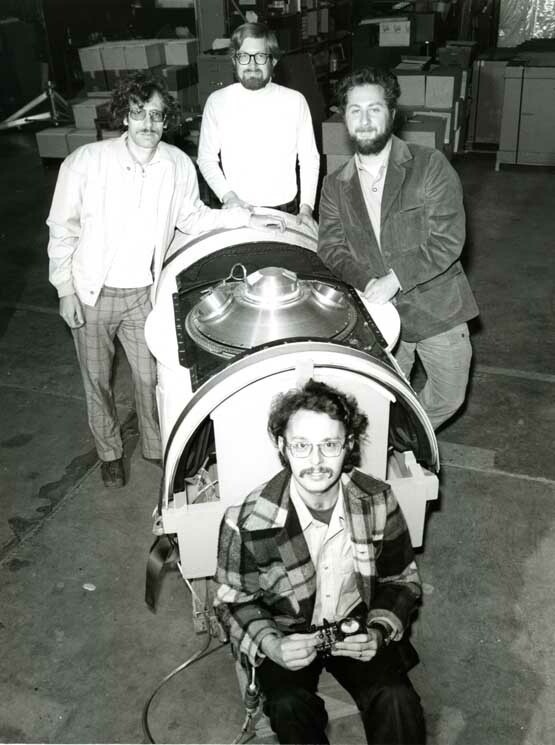 The second shows the hatch we modified, with me sitting in front, graduate student Steve Pollaine on the left, George standing behind, and Marc on the right. Click on either for a larger image. I continued to feel that it was my responsibility to mentor George. Hal Lewis asked me to participate in the first American Physical Society study of a societal issue: the safety of our current nuclear power reactors. He also asked me to suggest other names for the study. I thought the broad exposure that George would get on this study would be very helpful to him in the future; he was not yet well known outside of his speciality of particle physics. Hal agreed, and George served with us on what proved to be a very important and interesting study on the safety of light water nuclear reactors ( Rev. Mod. Phys. 47 Suppl 1, 1975). In the spring of 1977, George told me and Marc that his analysis of our data was showing a real anisotropy. Up until then, we had been flying monthly, but George realized that we could confirm the result by scheduling two flights in a row, one just after sunset and the next just before sunrise. Since the flights were twelve hours apart, they should show opposite effects. They did. We then got approval to fly three flights a week apart. These were in April 1977, at 6pm, 10 pm, and 5:30 pm. With these, the sky coverage was excellent (although confined to the northern hemisphere. I got the raw data to analyze it independently, and confirmed the anisotropy. Marc and I plotted the results, and concluded that it fit a rough cosine shape, with a peak (maximum intensity) in the direction of the constellation of Leo. I looked back at the papers of Conklin and Hills, and discovered that their direction, Virgo, was an adjacent constellation! Even though their data had been unconvincing (to nearly everyone, except maybe them), their direction was approximately correct. As PI, and the creator of the project, I had the honor and responsibility of writing the discovery paper. I wrote a draft. I recently found the old draft and scanned it in. It is: Detection of Anisotropy in the Cosmic Blackbody Radiation -- Draft. I did the actual writing for the bulk of the paper. You'll see at the end how I divided the data up into bins in order to create the "cosine" curve, so that it would be evident to the eye that we had good evidence for the cosine. That distinguished our work from the prior work of Conklin and Henry. They had actually found a signal, but did not have the precision to be able to convince skeptics that they were right. We could not claim that were the first to detect an anisotropy, but we could lay claim to detecting its cosine shape. George made corrections, and wrote the section with all the references. You might enjoy comparing this paper to the final published version, Detection of Anisotropy in the Cosmic Blackbody Radiation, which appeared in Physical Review Letters. Afterwards, I wrote a Scientific American article about the project. I think this is the article that gives the non-expert the best feel for the almost innumerable technical difficulties that a project faces when attempting to improve upon prior good experiments. Arnold Penzias also liked my explanation of the origin of the background, and he once told me that it was the reference that he would give to people to help them understand the 3K. When I showed my draft of the discovery paper to George, he was surprised to see that I had placed his name as the first author. I explained my reasons to him. I expected to get many rewards for this discovery. I felt that it was my responsibility to see that George got a share of the credit. If he were just another co-author, he would not get noticed. I was not concerned that I would be forgotten; everyone knew that I was the creator of the project and the PI. In fact, I have been well rewarded for the U-2 project. Luie nominated me for the Texas Instruments Founder's Prize (which I won), and for the National Science Foundation Alan T. Waterman Award, something they consider to be their most important and prestigious prize, and I won that too. A few years later, I was given a MacArthur Prize Fellowship. I was offered a tenured faculty position at Berkeley, largely on the results of the U-2 discovery and my invention of AMS. In 1989, I was cited by Newsweek as one of the top 25 innovators in the United States. As I said, I was well-rewarded. The COBE anisotropy system is very similar to our U-2 design (see the images below: the U-2 is on the left, and the COBE instrument on the right). 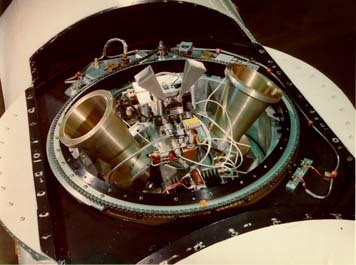 I was not involved in the COBE satellite, so I can't address the issues of who did what, although I understand that one key improvement, pushed by Phil Lubin and Chuck Bennett, was to substitute cooled detectors to improve the sensitivity. I also feel great personal pride in the fact that my nurturing and mentoring of George Smoot helped propel him to his Nobel Prize in physics.